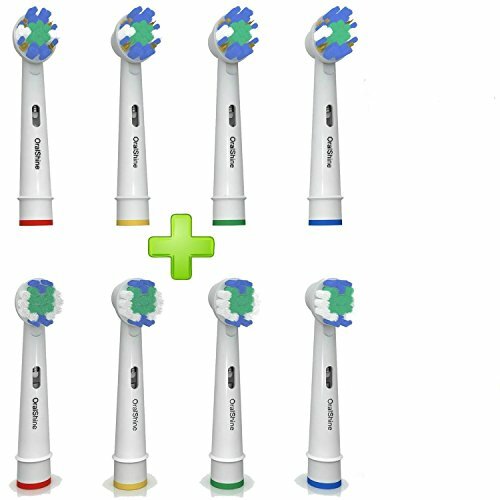 OralShine Electric Toothbrush Replacement Heads 8PK Only $8.21 Shipped (Oral-B & Braun) ONLY $1.03 per toothbrush head! Head on over toAmazon where you can grab this The Ultimate Oral B Braun Replacement Best Electric Toothbrush Heads (8) | 4 Floss Action Heads Plus 4 Complimentary Soft Brush Heads | Remove Plaque And Decrease Gingivitis for ONLY $8.21 (was $25.99) when you opt for subscribe and save and use the code OralShine21 at checkout!!! That’s just $1.03 per toothbrush head! ✅ PREMIUM QUALITY ORAL B BRUAN REPLACEMENT TOOTHBRUSH HEADS✔ OralShines’ High Quality Oral-B Replacement Toothbrush Head Set Is Great If You Have Just Purchased Your Electric Oral B Toothbrush Ranging From The Oral B 5000, 7000, Super Floss And Several Others + Looking For The Perfect Replacement Heads. OralShines’ Oral B Replacement Brush Head Set Of 4 Will Serve All Of Your Brushing Needs. We’re Also Including A FREE Set Of 4 Soft Bristles That Work Great For Receding Gums. ✅ THE ULTIMATE 4 & 4 REPLACEMENT TOOTHBRUSH HEAD SET✔ Along With The 4 Regular Toothbrush Heads, You Will Be Offered 4 FREE Brush Heads With Soft Bristles. These Toothbrush Heads Are Ideal For Women, Men and Kid Tested. OralShine Helps You Pay Extra Attention To Your Oral Hygiene Because We Also Hate Spending A Fortune At The Dentist’s Office.